We are in the midst of enjoying the divine glories of AzhwArs/AchAryas who appeared in this auspicious month of aippasi. Please view http://ponnadi.blogspot.in/p/aippasi-thula-masa-anubhavam.html for full glories of this month. It is said that "madhurEna samApayEth" - so let us end this year's aippasi anubhavam sweetly. As we are at the end of this month, we will now briefly observe the glories of mAmunigaL specifically his literary contribution to our sath sampradhAyam. In the 28th pAsuram of Arthi prabhandham, mAmunigaL himself highlights how he spent his time for the upliftment of the entire world. In the first 2 lines (as split above), mAmunigaL explains that he searched and collected all the pUrvAchArya granthams which were lost/dispersed during muslim invasion. These granthams were written by the great compassion of pUrvAchAryas towards the hitham (well being) of all the future generations. Whatever granthams he found, he wrote them personally in palm leaves, he learnt them from his AchAryans (thiruvAimozhi piLLai, etc), lived according to the instructions in those granthams, and taught those to all his disciples. In the next 2 lines (as split above), mAmunigaL says, before getting the mercy of emperumAnAr through his AchAryan thiruvAimozhi piLLai, he did not have any desire to go to paramapadham, but once he got that mercy he could not stop thinking about going to paramapadham for even a single moment. There is a popular thamizh pAsuram which beautifully brings out the glories of mAmunigaL's divine contribution. 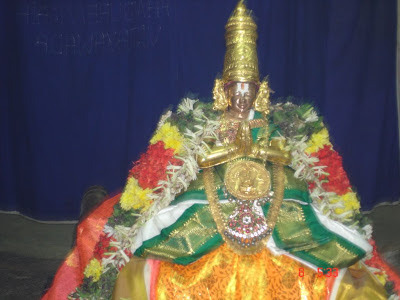 Simple translation: In this world where many great personalities engage in glorifying srI ranganAthan who lives in srIrangam which is surrounded by natural beauty, Had the incomparable and gold-like pristine maNavALa mAmunigaL not appeared, the thamizh vEdham (thiruvAimozhi) would have become lost like tamarind mixed in river (tamarind in a big river would have no impact, similarly, Had mAmunigaL not highlight the glories of thiruvAimozhi to the fullest potential, it would have become insignificant in this ocean of samsAram). mAmunigaL fully focussed on gathering the vast knowledge of our sath sampradhAyam and wonderfully documented the same in the most precise manner for the benefit of everyone. Let us briefly enjoy his various literary contributions and understand the brilliance and benevolence of mAmunigaL. yathirAja vimsathi - On the orders of thiruvAimozhi piLLai, mAmunigaL (during his gruhasthAsramam) takes care of bhavishyadhAchAryan (srI rAmAnuja) sannidhi in AzhwAr thirunagari. At that time, mAmunigaL composes this beautiful prabhandham which contains 20 slOkas that highlights mAmunigaL's great attachment towards yathirAja (srI rAmAnuja). He manifests his total dependence on emperumAnAr and recollects thiruvAimozhi piLLai's great compassion in leading him to emperumAnAr. 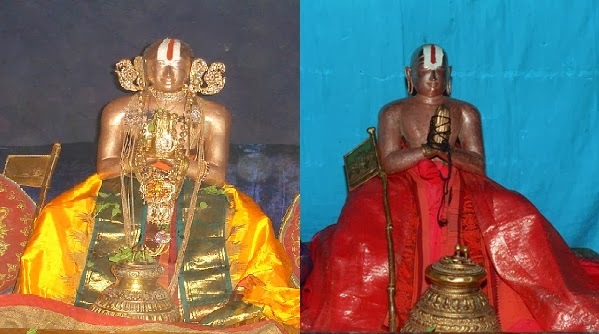 mAmunigaL is yathi punaravathAram (reincarnation of srI rAmAnuja) - a question arises here - why would he glorify srI rAmAnuja who is none other than himself? Our elders explain that, just like srI rAma himself worshipped srIman nArAyaNan in thrEthA yugam to demonstrate how to properly worship him (as we dont know how to worship him), mAmunigaL also demonstrated his divine emotions towards srI rAmAnuja, so that we understand how to approach and glorify emperumAnAr. dhEvarAja mangaLam - While visiting kAnchIpuram, mAmunigaL composes this beautiful prabhandham which highlights dhEva perumAL's mercy. mangaLAsAsanam (praying/wishing for the well-being) is the highest principle of our sath sampradhAyam. mAmunigaL beautifully performs mangaLAsAsanam to dhEva perumAL. He also recollects thirukkachi nambi's kainkaryam to dhEva perumAL and demonstrates the proper path to us - approaching emperumAn through an AchArya. upadhEsa rathina mAlai - With the intent of bringing out the full glories of piLLai lOkAchAryar and his great work named "srI vachana bhUshaNam", mAmunigaL systematically explains the appearance stars/months of AzhwArs, the special position of emperumAnAr, emperumAnAr's divine desire and facilitation of vyAkyAnams (commentaries) for thiruvAimozhi, journey of eedu vyAkyAnam, nampiLLai's glories, piLLai lOkAchAryar's divine appearance, greatness of srI vachana bhUshaNa dhivya sAsthram, highlighting the essence of srI vachana bhUshaNa dhivya sAsthram, importance of preaching and following pUrvAchAryas' instructions as it is and finally highlighting how such followers will become very dear to emperumAnAr. thiruvAimozhi nURRanthAdhi - One of the most beautiful works by mAmunigaL. This is compared to honey in sweetness by scholars. mAmunigaL was greatly immersed in nampiLLai's eedu vyAkyAnam for thiruvAimozhi, which is why he was able to fully decimate the divine meanings of thiruvAimozhi. It is because of this reason, srI ranganAtha ordered mAmunigaL to explain thiruvAimozhi with the help of eedu vyAkyAnam right in front of his sannidhi in srIrangam periya kOil. piLLai lOkam jIyar, in his vyAkyAnam for this grantham highlights that considering the length of thiruvAimozhi (1112 pAsurams) and the difficulty in grasping the essence from that, mAmunigaL mercifully writes this grantham which brings out the essence of thiruvAimozhi. He goes on to highlight these most wonderful aspects of this divine prabhandham. Just like there is rAmAnusa nURRanthAdhi to remember the glories of srI rAmAnuja, this thiruvAimozhi nURRanthAdhi helps us remember the glories of nammAzhwAr. 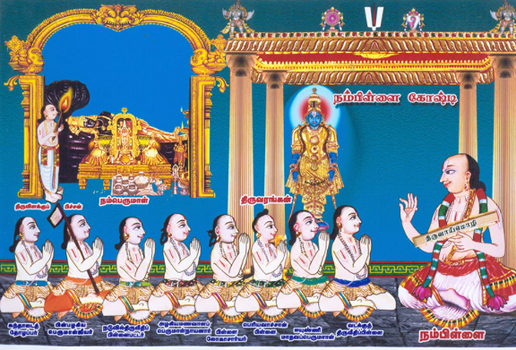 Each padhigam (11 pAsurams) of thiruvAimozhi is explained in one pAsuram of nURRanthAdhi. The pAsuram begins and ends with the same word as in the padhigam. Each pAsuram reflects the essential principles that are explained in that padhigam. It resembles the salient points that are highlighted by nampiLLai in his eedu vyAkyAnam introduction sections for the respective padhigam. Each pAsuram reflects one particular name of nammAzhwAr such as sadagOpan, mARan, kArimARan, vazhuthi nAdan, parAngusan, etc. It is composed in veNbA meter with anthAdhi kramam (end of one pAsuram being the start of next pAsuram) - this type of meter is difficult to compose but easy to remember and recite. Arthi prabhandham - Towards the end of his time in this samsAram, mAmunigaL composed Arthi prabhandham which is a divine outpouring of his emotions towards emperumAnAr praying to be relieved from this samsAram and to ascend to parampadham. This prabhandham is of great importance for our sath sampradhAyam as mAmunigaL presents many essential principles in this wonderful prabhandham. piLLai lOkam jIyar nicely highlights in his introduction for this prabhandham that "mAmunigaL reveals the ultimate principle of charama parva nishtai (ultimate dependence towards AchArya) is the charamAvathi in prApyam (the ultimate state in accomplishable goals) in his charama (last) prabhandham during his charama (last) kAlam (days)". jIyar padi thiruvArAdhana kramam - A simplified version of how to perform thiruvArAdhanam. 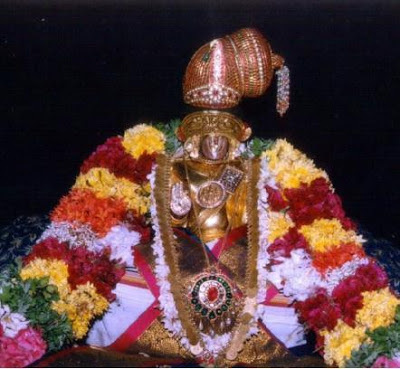 As part of panchasamskAram one learns thiruvArAdhana kramam (deity worship method) from AchArya and performs thiruvArAdhanam to ones own gruhArchai (deities at home). emperumAnAr blessed us with nithya grantham which is in samskritham that explains thiruvArAdhana kramam. As mAmunigaL descended to present all the essential principles in dhrAvida bAshai (thamizh language), he blessed us with the thiruvArAdhana kramam also in thamizh language. pramANa thirattu for eedu vyAkyAnam - nampiLLai's eedu vyAkyAnam is the greatest treasure of our sath sampradhAyam. Due to his experties in all sAsthrams, nampiLLai quotes so many pramANams in his vyAkyAnam. mAmunigaL, out of great compassion highlighted the source of the pramANams with full text wherever applicable. periyAzhwAr thirumozhi (missing portions) - mAmunigaL's Arjavam (honesty) is incomparable. periyavAchAn piLLai had previously written a full vyAkyAnam for periyAzhwAr thirumozhi. But unfortunately most of the palm leaves were destroyed by termites. mAmunigaL wrote a commentary for this dhivya prabhandham and he stopped exactly at the word from where periyavAchAn piLLai's commentary existed. rAmAnusa nURRanthAdhi - This dhivya prabhandham is called prapanna gAyathri and is added into 4000 dhivya prabhandham by the divine will of srI ranganAtha. mAmunigaL composed precise explanations for this most celebrated grantham of amudhanAr and revealed the wonderful meanings that are found in this prabhandham. 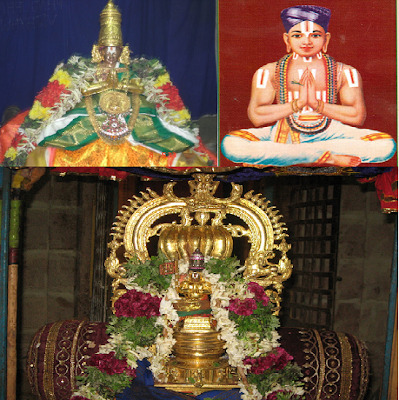 gyAna sAram and pramEya sAram - aruLALa perumAL emperumAnAr (previously yagya mUrthy) is a dear sishya of emperumAnAr. He presented the most essential principles of our sath sampradhAyam such as Acharya abhimAnam, bhagavAn's nirhEthuka krupai, ill-effects of committing AchArya/bhAgavatha apachAram, etc in gyAna sAram and pramEya sAram. piLLai lOkAchAryar subsequently explains these same principles in detail in his rahasya granthams as heard through the AchArya paramparai. mumukshuppadi - rahasya thrayam (thirumanthram, dhvayam, charama slOkam) are most essential to be understood and are revealed by the AchAryan to the sishya. piLLai lOkAchAryar, out of great compassion documented these principles in the most precise manner in mumukshuppadi. mAmunigaL composes a classical vyAkyanam explaining these principles in as much detail as necessary. mAmunigaL's introduction to mumukshuppadi can be viewed at http://ponnadi.blogspot.in/2013/10/aippasi-anubhavam-pillai-lokacharyar-mumukshuppadi.html. thathva thrayam - The true knowledge about the three entities (chith, achith and Iswara) is of paramount importance for the ones desiring for mOksham. piLLai lOkAchAryar explained these details in this prabhandham which is also called kutti bhAshyam (miniature version of srI bhAshyam). Without mAmunigaL's insightful vyAkyAnam with references to various pramANams, it would be impossible to understand these in-depth principles. mAmunigaL's introduction to thathva thrayam can be viewed at http://ponnadi.blogspot.in/2013/10/aippasi-anubhavam-pillai-lokacharyar-tattva-trayam.html. Brief and simple presentation of thathva thrayam can be viewed at http://ponnadi.blogspot.com/p/thathva-thrayam.html. srIvachana bhUshaNam - The essence of our sath sampradhAyam is the principle of AchArya abimAnam (the mercy of AchArya). This principle is elaborately explained by piLLai lOkAchAryar using the various AzhwArs/AchAryas srI sUkthis (divine words). mAmunigaL composed a brilliant and in-depth commentary for this glorious prabhandham which is cherished and celebrated by great scholars. mAmunigaL's introduction to srIvachana bhUshaNam can be viewed at http://ponnadi.blogspot.com/2013/11/aippasi-anubhavam-pillai-lokacharyar-srivachana-bhushanam-thanians.html, http://ponnadi.blogspot.in/2013/11/aippasi-anubhavam-pillai-lokacharyar-sri-vachana-bhushanam-1.html , http://ponnadi.blogspot.in/2013/11/aippasi-anubhavam-pillai-lokacharyar-sri-vachana-bhushanam-2.html , http://ponnadi.blogspot.in/2013/11/aippasi-anubhavam-pillai-lokacharyar-sri-vachana-bhushanam-3.html . AchArya hrudhayam - azhagiya maNavALa perumAL nAyanAr (the divine and dear younger brother of piLLai lOkAchAryar) composes a grantham named AchArya (nammAzhwAr) hrudhayam (divine heart). This grantham is fully composed using AzhwArs srI sUkthis (divine words) and reveals the true emotions of nammAzhwAr. Every word of this grantham has so many deep meanings and is invaluable. But it is not easily understandable for laymen. mAmunigaL writes a comprehensive vyAkyAnam for this wonderful prabhandham which brings out the shining radiance of this grantham. mAmunigaL, towards the end of his time in this samsAram, was writing the vyAkyAnam for AchArya hrudhayam with great physical difficulties. Seeing this, kOil aNNan enquires mAmunigaL why he should trouble himself in writing with great difficulties. mAmunigaL replies "I am writing for the benefit of your sons and grandsons (i.e. the future generation of srIvaishNavas)" - such was his compassion and concern for future generations to come and he mercifully paved the way for the upliftment of everyone. We have only focussed on the literary contribution of mAmunigaL in this article. There are so many glorious aspects in the life of mAmunigaL. Every aspect is vAchA magOcharam (beyond the capability of words to explain). In thaithriya upanishadh, bhagavAn's kalyANa guNams (auspicious qualities) are enquired. vEdham tries to comprehend Anandham (bliss) which is just one of the many innumerable auspicious qualities of bhagavAn but fails to comprehend even that single quality. Similarly, mAmunigaL's glories are innumerable. This only shows a glimpse of his glories that too with adiyen's limited abilities. Thus we have seen a glimpse of the divine literary contribution of mAmunigaL for our sath sampradhAyam. Let us bow down at the lotus feet of mAmunigaL and be blessed.